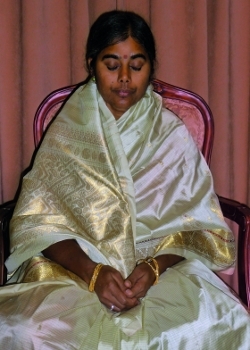 Mother Meera has said that it is good to meditate every day and that the best thing of all is to practise Japa – prayerful repetition of one of the names God. There are a multitude of techniques and they can be very complex as, for example, the visualizations of Hindu and Tibetan tantra. Nevertheless, most great Saints have agreed that the simple repetition of a Divine name is one of the most powerful practices. Mother is essentially practical and she recommends constant remembrance of God and Japa on the Divine name as the most effective method. What is essential is that the chosen Name should inspire you, so that it moves you inwardly with divine-seeking emotion. Because Japa is easy to do and can be practised silently in the heart and mind, it can be done anywhere, throughout all our daily tasks. Mother explains that any object the mind dwells upon generates a certain vibration and so each of the syllables of the divine name, lovingly repeated, creates a particular quality of vibration that builds up to form a protective field of consciousness around us. Japa is simple to incorporate into our sadhana (Sanskrit: lit. ‘system of spiritual practice’) even if we don’t have time for formal meditation. Mother’s yoga is one of balance that allows a seamless integration with daily life and ordinary activities. Everything offers an occasion to remember the Divine and aspire for Light: work, play, relationships – everything. This is the way of true surrender.